NOTE – Fly fishing is filled with accessories that our tolerant spouses often call “gadgets.” To my ear, “gadget” rings of something we would have and not necessarily use. That’s just not a part of my fly fishing. I can use just about anything hanging off my vest or pack at one time or another, every once in awhile … maybe. IF we’re older, maybe we need a little help with that vision thing. Help has arrived. Look, I am tired of having my magnifier lanyard weaving in with the sunglasses lanyard, creating a tangled mess that renders me frustrated beyond belief. Heck, I don’t want to even have to wear the darn magnifiers because that’s what I think old folks have to do. Then there are the clip on flip up type of magnifiers which are my magnifiers of choice. Sure enough, the spring action somehow blows out and I am left with a hand full of parts and pieces – most of them plastic, and all of them from China. Enter Flex Spex, a new accessory that I am confident will take the old geezer (like me) crowd by storm. 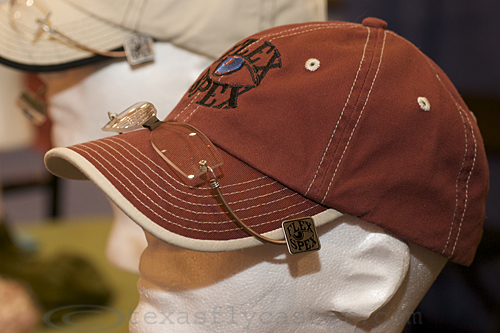 The Flex Spex clip onto the side of your favorite baseball cap, and the wound flexible wiring connects to the outside edge of the lenses with a stylish “hinge” without the hinge connection. All this makes sense when you realize the nose bridge is comprised of two magnets allowing you to pull them apart and around the bill of the cap and reconnect the magnets for lenses in front of your eyes. These would be just another fall apart magnifier if not for the firm feel of the metal arms, the super strong clips that attach to the bill, and the magnets that pop together from two inches apart. If they were any better, I couldn’t stand it. Why so good? They’re made in the good old US of A of course. 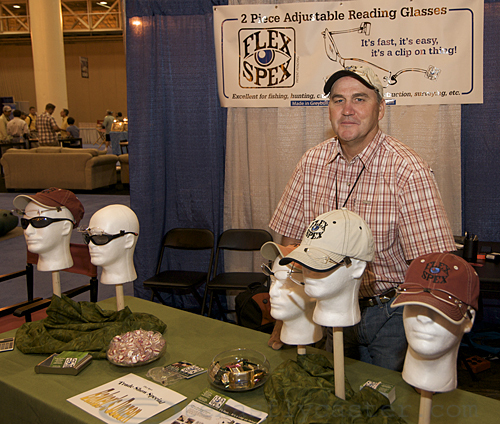 The Flex Spex are one of those inventions that make you slap your pocket and say, “Awww, I wish I would’ve thought of that!” I wore mine around the convention center floor, and they generated a lot of interest. The folks at Sportsman’s Finest in Austin, Texas, will be carrying them, and I will be ordering them for the Fly Shop here at Texas Fly Caster. Lefty was eyeballing them as well. 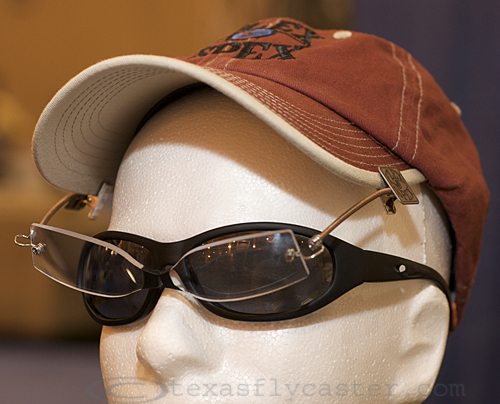 These are the images of Flex Spex. Flex Spex above the brim. Once you have them in position, you can bend the wire arms in any way you need to get the lenses on plane with your angle of vision. There were a few products so compelling that they will soon be in the “Fly Shop” section of Texas Fly Caster, but if you just can’t wait, go to www.flexspex.com. Here’s their video. Not exactly dramatic, but you get the idea. We all know what can happen when success gets to a company’s head, China can happen. Now, I don’t expect that from this crew, but you better believe I am stocking up now, and I’ll even be giving a few away if I pick your name this Christmas. Coming tomorrow – post on Texas vendors at the IFTD show. Just in time for weekend reading. Who wants to know about fishing anyway?